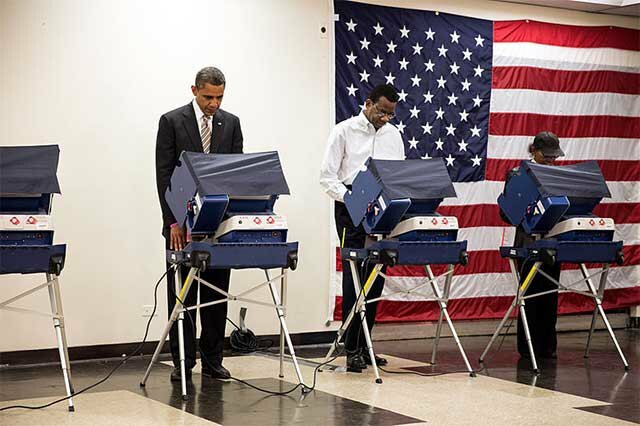 Obama casts his ballot during early voting in the 2012 U.S. election at the Martin Luther King Jr. Community Center in Chicago. Photo via Wikimedia Commons. Your chance to vote in one of the more contentious primaries in recent election cycles has arrived! If you're already registered to vote as a Democrat or a Republican, congrats, you've jumped through the first hoop. The second hoop, of course, is finding your polling location. Your best bet is not always the polling site closest to your apartment: New York Election Districts are a bit trickier than that. Thankfully, the Board of Elections lists polling sites on voter registration cards, but if you want to double check, the Board of Elections has a handy Poll Site Locator. Polls are open from 6:00am-9:00pm. See you there! And then see you at a primary results watching party after!